The cigar gets really mellow in the middle. This one fell apart on us but it had great flavor to the end. I ordered this nostalgic looking cigar. When I smoked it I was impressed with the flavor and the amount of time this cigar lasted. I would definitely buy this Egg again. got these for friends as they have never seen them before. they will be thrilled and not let down by them. great smokes and a great way to start a conversation at the local cigar lounge. Mild to medium body with a pleasant taste. Cool looking but very uneven smoke. Something to try at least once, but not your daily smoke I would guess. Larutan Egg By Drew Estate is rated 4.3 out of 5 based on 8 customer ratings. Is this cigar a good smoke or is it strictly a novelty? Seems like it would be hard to get an even burn. 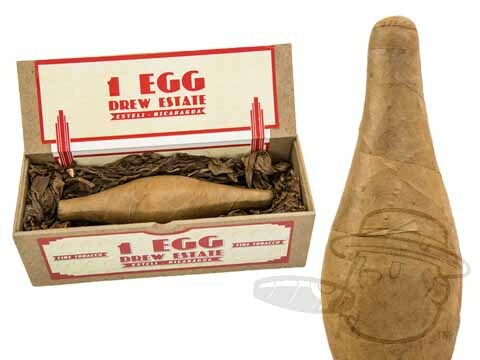 Though the Egg is an interesting looking cigar, the construction is nearly flawless. We have seen this cigar hold ash for the entire length of the cigar. It's smooth and creamy in taste, and as you get towards the largest portion of the cigar, the flavors start to build in complexity, eventually settling as the cigar tapers near the end. Though a novelty, it definitely does not lack in quality.